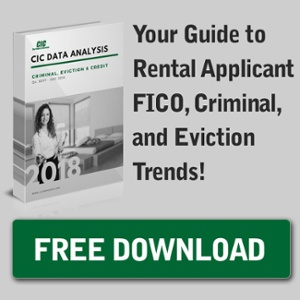 CIC, the nation’s most trusted supplier of information solutions for the multifamily housing industry, provides Experian RentBureau® data at no additional cost to clients receiving Experian® credit reports. Providing property managers with the most comprehensive reports, CIC helps mitigate undesirable rental risks. CIC, a nationwide leader in tenant screening for the multifamily housing industry and wholesale data market announced today that February 16, 2014 marked 28 years of industry excellence, delivering innovative solutions to protect its clients’ properties and investments. In the United States more than half of the country’s non-buying population is made up of real estate rentals. Some owners choose to hire a property management company to take care of the complete rental process, but oftentimes real estate agents and individual landlords are the ones tasked with filling vacancies. No matter who is renting a property the fact remains that applicants have rights that are protected by law. The same criteria must be used for all applicants so no arguments can be made alleging discrimination took place. Important questions still need to be answered though about whether the applicant will pay their bills on time, or if they have a past that would make them a risk to the property.